(Nanowerk News) "Flat" and "rigid" are terms typically used to describe electronic devices. But the increasing demand for flexible, wearable electronics, sensors, antennas and biomedical devices has led a team at Harvard's Wyss Institute for Biologically Inspired Engineering and the John A. Paulson School of Engineering and Applied Sciences (SEAS) to innovate an eye-popping new way of printing complex metallic architectures -- as though they are seemingly suspended in midair. 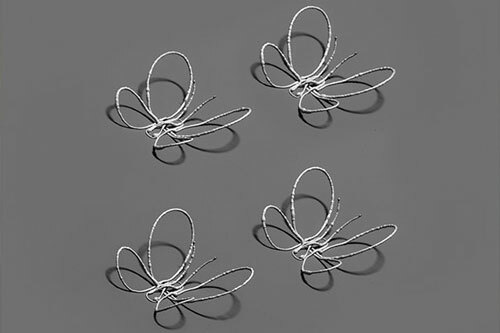 Reported online May 16, 2016 in the Proceedings of the National Academy of Sciences ("Laser-assisted direct ink writing of planar and 3D metal architectures"), this laser-assisted direct ink writing method allows microscopic metallic, free-standing 3D structures to be printed in one step without auxiliary support material. The research was led by Wyss Core Faculty member Jennifer Lewis, Sc.D., who is also the Hansjörg Wyss Professor of Biologically Inspired Engineering at SEAS. "If the laser gets too close to the nozzle during printing, heat is conducted upstream which clogs the nozzle with solidified ink," said Skylar-Scott. "To address this, we devised a heat transfer model to account for temperature distribution along a given silver wire pattern, allowing us to modulate the printing speed and distance between the nozzle and laser to elegantly control the laser annealing process 'on the fly.'"